Description: The HD485 are open, circumaural stereo headphones with exceptional sound characteristics and outstanding comfort. 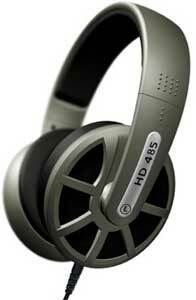 The HD 485 include a headphone holder that easily attaches to a table or shelf. I paid about $65 for my Sennheiser HD-485s back in August of 2006. Before I opened the box, I was a little disappointed to discover my ‘German’ headphones were made in China (but with European acoustics). Given the superb sound quality for the money, I’m not going to make an issue of the mostly plastic construction and Chinese origins. I am satisfied with the value for dollar spent, and perhaps the use of plastic is one reason the HD 485s are so light and comfortable. Range and definition are better than anything else I’ve listened to (admittedly, not that many). For many listeners, deep bass seems to be the Holy Grail – but for me, clear mid-tones and brilliant highs and have always been more important. I have never wanted a lot of bass unless it is tight and well controlled – perhaps that’s ‘sour grapes’ because I’ve never been willing to spend the money that’s necessary to get deep, accurate bass from a floor standing speaker. The good news is: with the HD-485s I get it all. I don’t claim to have golden ears, and I don’t have million dollar playback equipment, but I have found the sound from the HD-485s to be excellent from top to bottom. My source material includes CDs (and occasionally, vinyl LPs) played on moderately priced component audio equipment, as well as a portable CD player, an iPod Shuffle, and MP3/AAC files in my iTunes library. Genres include rock, world, latin, pop, and classical – and it all sounds good to me through the Sennheisers. Despite being full size 32 ohm headphones, my 2ond gen iPod Shuffle has no problem driving the 485s to a decent volume – as loud as I would ever listen. The long cord (3 meter) is sometimes a nuisance, but sometimes an advantage. It is a nice weight wire, heavy enough to survive my chair rolling over it, but not so heavy as to interfere with mobility. If I do manage to damage it, it’s nice to know it can easily be replaced. A significant amount of transient noise can be heard while wearing the 485s, but for me that’s not a bad thing. My listening environment is not noisy, and if someone is knocking on the door, or if I’m standing on the cat’s tail, I want to know it. The Koss Pro4AAs actually compare favorably in the high range – different – but once I turn up the volume to match the sound level of the more efficient 485s, the old 4AAs still offer clean mid-range and high reproduction. In some respects the Pro4AAs sound smoother than the HD-485s – in the same sense that an older person’s face looks smoother without my eyeglasses. Bottom line – I would not hesitate to recommend the Sennheiser HD 485s to anyone for any reason unless you need to block out a lot of environmental noise or will be very active while wearing them. The only reason I’m not giving the HD-485s a 5 star overall rating is because I’ve not compared them to $300-and-up headphones; it’s hard for me to imagine how they could be that much better than the HD-485s, but I can’t say for sure if these are 5 star phones without a critical A-to-B comparison to some top shelf models. B&H Photo Video Pro Audio $89.95 *MOST TRUSTED* Online Retailer – Lowest Prices on Genuine Accessories – 5 STAR Top Rated Seller! $185.99 Fantastic prices with ease & comfort of Amazon.com! Top Ranked Products from Sennheiser.